The adjustable foot that supports the pilasters is made from corrosion resistant nylon (Polyamide-6) and its base is anchored to the floor with nylon plug inserted into ground with stainless steel screws. There is a ground clearance of 150mm. 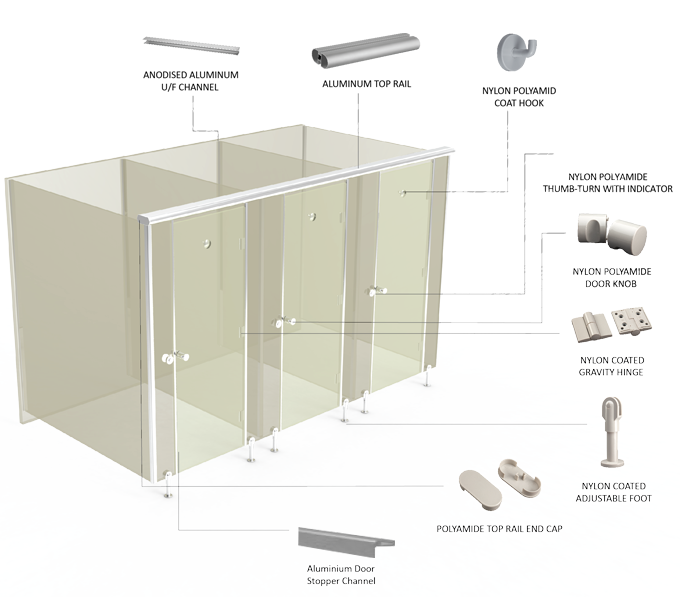 Aluminum U-channels are used to attach the divider panel with stainless steel (Grade-304) screw inserts to the wall as well as the mid panel. Aluminum top rail (Grade-6063-T5 Alloy) is used to fix the pilasters at the top. Door stopper channel provides the non-rebating doors and connecting panels with extra ordinary look. Further the doors are incorporated with the noise deafening tape to reduce the noise effect.